In the sweltering summer of 1938 in Portugal, a country under the fascist shadow of Spain, a mysterious young man arrives at the doorstep of Dr Pereira. So begins an unlikely alliance that will result in a devastating act of rebellion. This is Pereira’s testimony. The book goes to Bettina (Liburuak). Please send me your address via beautyisasleepingcat at gmail dot com. 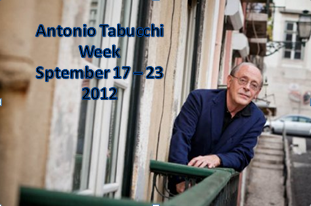 For those who want to know more about Tabucchi Week and want to join, here are the details. I am really looking forward reading lot of different views on the same author while at the same time reading the author myself. This will be a first for me. I usually like this type of event a lot. It’s similar to a readalong but with more liberties. You can choose which book yu’d like to read and publish anytime you like. It will be great. Or at leats I hope so. Sorry this took so long for me to realise! I left on Friday afternoon to spend the weekend away from all devices of modern communication :). It was lovely to find out I’d won when I came back to civilisation last night! Thanks so much for hosting this giveaway and Tabucchi week. Don’t worry, I thought you were gone. You’re welcome. I’m looking forward to see what everyone is reading. I’m readig Pereira Maintains as well and short stories.